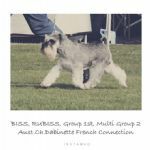 TRIPLE (3) BACK TO BACK (Consecutive) SPECIALTY SHOW DOG CHALLENGE WINNER ALL IN 2017 AT SCHNAUZER CLUB OF VICTORIA SPECIALTY SHOWS!! BEST IN SPECIALTY SHOW WINNER, RUNNER UP BEST IN SPECIALTY SHOW WINNER AND RUNNER UP BEST OF BREED IN SPECIALTY SHOW WINNER CONSECUTIVELY IN 2017 AT SCHNAUZER CLUB OF VICTORIA SPECIALTY SHOWS!!! Cooper wins Runner up Best of Breed Miniature Schnauzers, Best Intermediate in Show and Breed at the September 2017 Schnauzer Club of Victoria Specialty Show (PM) under Specialist Judge Mr Tony McDermott (UK). 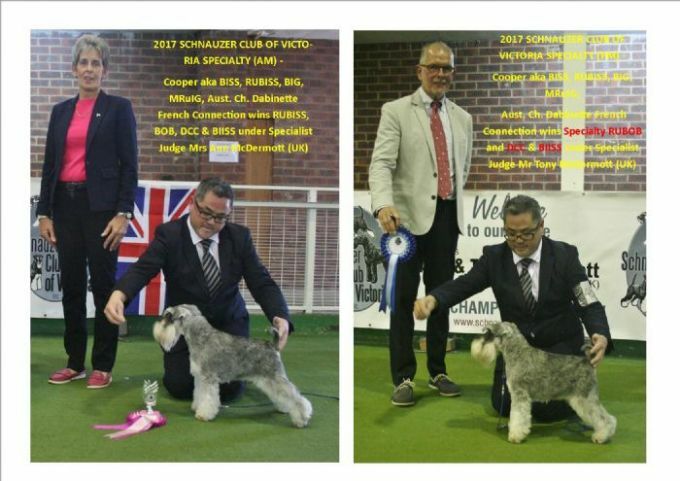 Cooper wins BISS - Best Exhibit In Show 2017 Schnauzer Club of Victoria 19 March 2017! Thank you Mr Rasmussen! Cooper wins Best in Group 2 under respected International All-Breeds Judge Mrs Rickard on 04 June 2017! So grateful for this honour! Wow! We are very proud of our youngster for his achievements thus far. At just 9 month of age, Cooper attained his Australian Champion title and collected a Best Exhibit in Group, many classes in show, classes in group and classes in specialty shows! 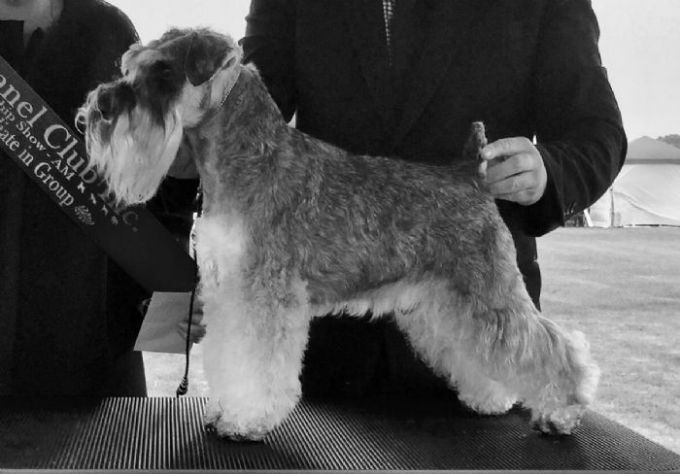 Cooper comes predominantly (3/4) from the lines of "Empire Miniature Schnauzer kennels in Canada" home to some of the most beautiful Miniature Schnauzers and owned by Vicki and Greg Stephens. Cooper is brother to Gr Ch. Dabinette Special Agent Gibbs, a back to back BISS winner by the same sire! Cooper is a full brother to Aust. Ch. Dabinette Game Changer! Whilst still only at 9 months of age Cooper kicked off 2016 with a Best Exhibit In Group, BOB and DCC under esteemed and respected All Breeds Judge Mrs Stephanie Rickard and Best Puppy In Group and Best Puppy in Show on 03 January 2016. Cooper was also awarded BOB, Puppy In Group and shortlisted for Best Exhibit In Group and Puppy in Show under Mr Wayne Douglas, respected All Breeds Judge. Your recognition is appreciated! 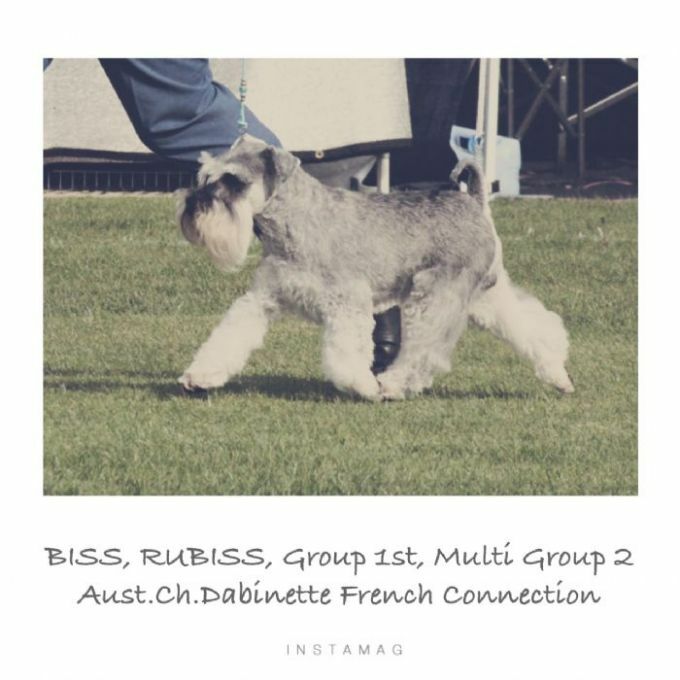 - BISS - Best Exhibit In Specialty Show 2017 Schnauzer Club of Victoria 19 March 2017 under renowned All Breed Judge, Mr Ian Rasmussen (Qld)! 1st photo - Cooper winning Best of Breed and Best Intermediate in Group at Colac! 3rd photo. Cooper on the move! Thank you to all the judges for recognising Cooper's qualities. Most importantly... Cooper is a fantastic sire and loves his puppies. A great ambassador for the breed! Health and Eye Tested to be free of Cataracts!